Just a update on this project. If I had any complaints after much listening it would be I found the top end of the sound a little in your face at times, not really relaxing. At first I was thinking maybe I need an EQ to tweak some of the brightness out. I did some reading over at the headwize site and after looking over the signal processor projects section I decided to have a go at building the modified Linkwitz Simulator. I found myself with a unexpected afternoon off work and thinking I had just about enough parts to build a prototype without having to go shopping... This is what I came up with, all the socketed stuff is so I could try out the mods mentioned in the addendum section and the switch is a bypass so I could compare the effected and clean sound. At first I wondered if it was working, the effect seemed very subtle but after listening to lots of music I can really hear the difference... the sound does sound like it coming from speakers now, the bright top end I was finding was bordering on harsh is still there but seems to be pushed back into the mix and seems more balanced, with this it also seems to make the bottom end more noticeable or better blended. I'm at a point now where I find when I bypass the effect I find the music kind of sickly sweet (for lack of a better explanation) all the top end stuff is all around my ears and harsh and all the lower and mids are across the room and get swamped by the highs... I'm sure I haven't done a great job of explaining it but in a nut shell I'm sold! I'm currently working on a mains powered (only) Cmoy in a bigger enclosure with the Linkwitz built in that will be permanently attached to my CD player. Nice work Laika. I have not tried the simulator yet, so thanks for sharing. 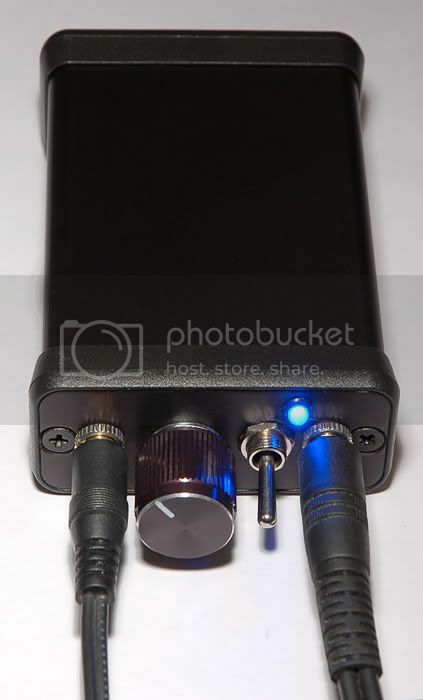 It sounds like you can use it before or after the headphone amplifier. Did you try both and was there an audible difference? hi i have been trying to build this op amp from the same opa 2134pa chip for a few weeks now with no luck. I have been having trouble finding a single schematic to work with that uses a single 9v battery source. 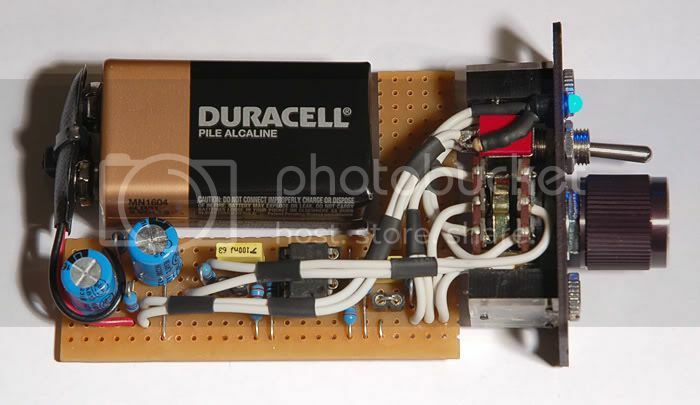 It would be very helpful if you can post the schematic you used to develop this amp. I just finished off my first amp build (I have made a few guitar effects previously) and thought I'd show it off ... Its a stock Cmoy except the power caps have been upped to 470's and I'm only using one 9v battery. The chip is a BB OPA2134PA. The enclosure is a Hammond 1455. I had thought of etching a board for it but it seemed so suited to stripboard I didn't bother. Everything except the chip was bought locally, that I got from smallbearelec.com (where i buy my guitar effect parts). The two sockets with jumpers are for the optional output resistors. can you post the schematic you used to make this? i can only find ones that use 2 9v sources. Very nice Amp, I like the design and how compact you made it ! Post more about your transistor amp. There are basically two ways to run a Cmoy amp from just one 9 V battery. First off you can AC couple the inputs and outputs of the amplifier. The right values for the capacitors are determined by the input impedance of your amplifier and the impedance of your headphones. Give 100 nF for the input and 1 uF for the output a try. There still is a second possibility: creating what is called a virtual ground. tangentsoft has a great overview of several ground splitting circuits which you can find here http://tangentsoft.net/elec/vgrounds.html. The easiest way by far to get two supplies plus ground from a single source is the TLE2426 from TI (http://www.ti.com/product/tle2426). Laika's seems to have used the resistor divider circuit. I built a Cmoy clone myself (also using the OPA2134) with very nice results. However I didn't like the idea of an unbuffered rail splitter and therefore used an LM358 opamp to buffer it. thanks, I have spent many days reviewing that website and have gotten stuck with the fact that his circuit is with a opa134, which is only a one channel amp. I managed to get the circuit working on my breadboard after determining with the help of a oscilloscope that the source of my problem was the output aux jack being messed up. Now when I play music with my 32ohm shure 750DJ headphones I get an amazing sound but it becomes dimmer in one ear as i rotate the pot counter clockwise. could this be from the input wires to the pot being backwards? and it sounds scratchy in one ear as i adjust the pot. here is a picture of the circuit just so you can get an idea of what leads are connecting where to the pot. 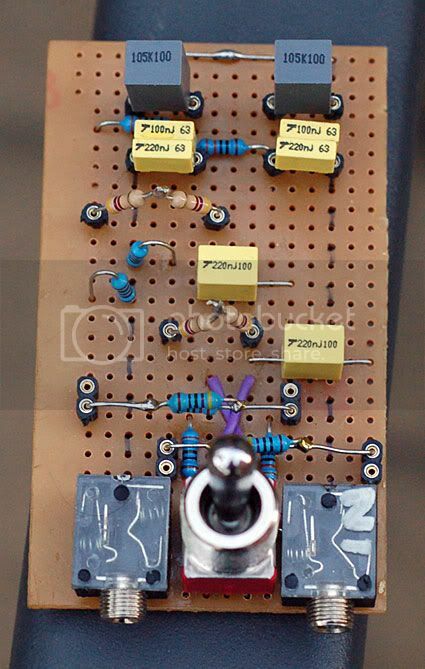 the highlighted areas on the breadboard are the common grounds. how important is it to use the low tolerance resitors in the circuit? would that be the reason why i here buzzing when no music is playing but the circuit is turned on? and If I have a decibal meter (also in picture) what leads go where to read the gain? when i attach the 20K pot I get gain overload on the scope. I heard that if you add two 10K resistors in parallel with the ground lead of the pot it should fix the problem, making the 20k pot a 10k pot. however when I connect it, I get the same overload problem!!!!! Any ideas?? It would help alot if i could get a schematic showing which leads connect to what pins on the Dual pot. It would be helpful if someone could help explain the reason why there are capacitors in the power circuit? and what happens in the circuit when you increase the power caps? I have been using 470uF, but I found some small 2200uF's, how would these effect the rest of the circuit? If i try to bulid the circuit from the opa134 schematic I get lost because the pins are configured differently than the one im using, opa2134pa. How do I know which leads will go where from the opa134 schematic to the opa2134 schematic im trying to design? thanks!! here's how the pinout differs from the single to the dual OPA. I've added a wiring Plan (from Rainer Böttchers) to see how to wire a complete dual channel C-Moy. and the resistors to divide the single 9V voltage from the Battery by equalizing the Bat. positive and Bat. 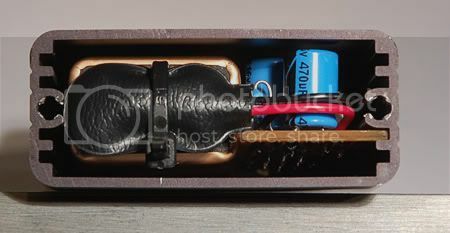 ground between this two caps in the middle of the resistor connection at the caps. 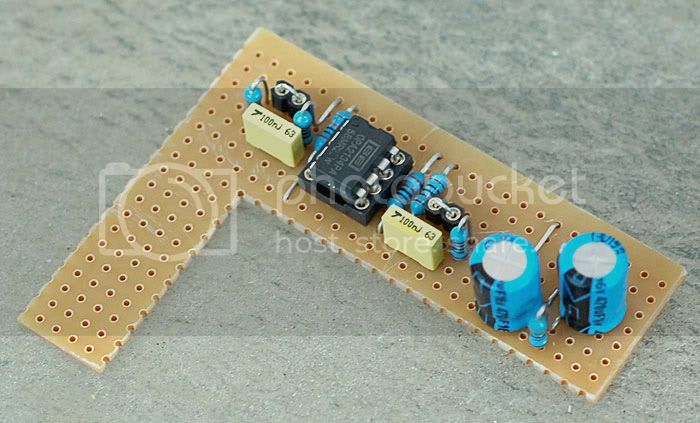 This middle connection becomes the "virtual ground" rail which re-defines the upper cap as positive voltage rail and the lower cap as negative voltage rail. The divider switches the Battery ground to a negative potential (relative to the divider ground or 0 = zero) and the caps provide the dual symmetric voltages. The 2200uF caps are OK so far. They'll need a little(!) longer to charge, but i don't see any problems. They are used as buffer caps and rail decoupling caps. I hope that helps .